Mason Mount revealed he snubbed Southampton as a youngster because of his Pompey roots. And the midfielder admitted turning down the Blues for a move to Chelsea was a tough decision. Mount is regarded as one of the most exciting talents in England. The former Purbrook Park pupil is currently on loan from Stamford Bridge at Derby County and has scored four goals in eight appearances for Frank Lampard’s side. The 19-year-old also netted the winner on his debut to deliver England under-21s a 2-1 victory over Latvia on Tuesday. As a junior, Mount was on the books at Fratton Park, as well as holding a season ticket, but ultimately opted to join Chelsea. However, he also had a short stint at Southampton – but baulked at having to wear the club’s kit in training. Mount told the Sun: ‘It was tough to turn down Pompey. I was a massive fan, season-ticket holder and grew up watching them. ‘Southampton wasn't as tough! I went there and I had to wear the kit and just didn't want to in training. ‘No disrespect but I am a Pompey boy! I found it too hard wearing that kit. 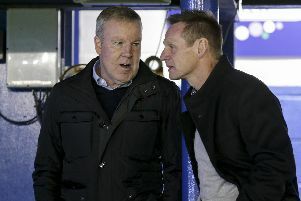 ‘It was hard turning Pompey down but the difference between them and Chelsea was massive.